The musical How to Succeed in Business Without Really Trying is set to close after 15 months on Broadway. Producers said the Tony Award-winning revival has suffered from several months of poor box office takings. Its last performance at the Al Hirschfeld Theatre is due on 20 May. 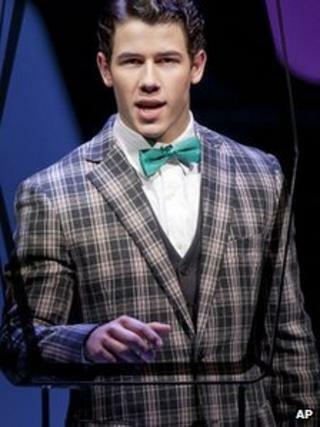 The show, which opened to rave reviews in February last year with Daniel Radcliffe in the lead, now features Nick Jonas as the ambitious J Pierrepont Finch. It also stars Beau Bridges and Ugly Betty actor Michael Urie. Jonas took over the lead in January after Glee star Darren Criss performed a three-week stint following Radcliffe's departure. The musician, who is best known for his pop band The Jonas Brothers, had been due to remain with the production until 1 July, however ticket sales have slumped in recent months. Last week, the box office took in just $368,000 (£228,000) out of a potential $1,394,000 (£864,000). "My producing partners and I are extremely grateful to the unbelievably talented company of actors and skilful crew that have given vibrant life to this show for over 500 performances," producer Michael McCabe said in a statement. The show was nominated for nine Tony Awards last year, including best revival of a musical, although Radcliffe was not nominated despite positive reviews. It came away with one prize for John Larroquette, who won the award for best featured actor in a musical.